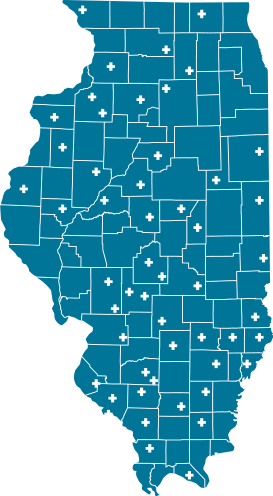 ICAHN, in collaboration with the NIU Center for Governmental Studies, recently announced the completion of "Illinois Critical Access Hospitals: Exploring the Financial Impacts of the Swing Bed Program," part of its 2019 Rural Health Care White Paper Series. The Illinois Diabetes Symposium, "Beyond Blood Sugar," will be presented on May 14-15 at the Crowne Plaza & Conference Center in Springfield. There will be a special tract on Day Two for school nurses, as well as an opportunity to meet diabetes vendors. The 2019 Behavioral Healthcare Conference, "Addressing Social Determinants of Health in Illinois" will be held on April 4 at the Illinois Education Association in Springfield. Representatives from the National Council for Behavioral Health and the Illinois Department of Human Services will serve as featured speakers. Illinois Governor J.B. Pritzker signed SB1469 into law today during his visit to Ferrell Hospital in Eldorado, IL, establishing $55 million in funding for critical access hospitals throughout the state. Still not sure how all of these data reports make a difference for the ACO? The IRCCO team is offering extended education on the importance of understanding and utilizing data in this four-part webinar series. Each webinar will tackle a different aspect of the data reports. In cooperation with Illinois Association of Medicaid Health Plans (IAMHP) and Illinois American Association of Healthcare Administrative Management (IL AAHAM), ICAHN presents this three-part webinar series dedicated to serve as MCO training sessions for CAH and rural hospitals. As a member-driven organization of 57 critical access and small, rural hospitals, we believe our strength lies in the work we do together. Through collaboration we can positively impact the future of CAHs and their rural communities.